Rare early production beautiful chrome chaise longues with adjustable height. 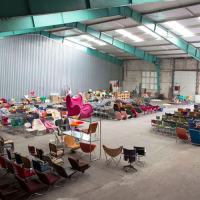 The history from the chair is it is bought from a former Knoll dealer in the Netherlands. The height of this chaise longues is adjustable by hand in three positions (see pictures #3 - #5) by lifting the whole seat and having the option to attach with one of the three 'hooks' on the base (#!4 - #16). An extra round headrest pillow is available, custom made, that is not original and made of another leather type than the upholstery of the chaise longues itself. The chaise longues shows traces of wear; the leather is soft and still good but shows more wrinkles and some 'cracks' on the seat part and under the legs (#11 and #13) while on the backrest the leather is still looking very good. The leather has some tiny damages (#! !, #13, #18 and #19). The chrome base is still very good but shows at just some spots a bit damage (#19). The lounge chair consists of two separate elements and picture #20 shows the chrome base. This rare early production MR chaise loungechair by Ludwig Mies van der Rohe is showcased in leather and is in very good condition for its age. This chair can make an entirely empty room feel complete - giving the owner something so special to lounge in, whether to read a book or soak in a view, that nothing else in the room would be required. Or, transversely, this chaise can occupy a room complete with other furnishings and either be the conversation piece or statement item, or due to the neutral colours, blend in perfectly with most any decor. 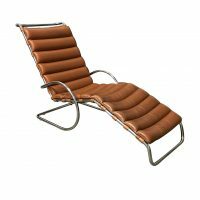 Pairs wonderfully with the Barcelona chair or daybed, or other tubular chairs such as Marcel Breuer's Wassily chair. The long, sloped seat is supported with belts all along each side, securing the cushion onto its frame. The chair reclines into a support of tubular stainless steel, adjustable to three different height settings. Ready for immediate use in your residential or commercial project. 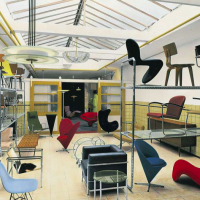 Some relevant communication we got about the chair by Knoll International : Knoll International did not begin putting authentication on the frames until the mid 1990s. They began issues Certificates of Authenticity in 2004.